I want to be someone who packs light, I really do. But I’m a mood dresser — I never know exactly what I’ll want to wear until mere moments before the occasion arises. This philosophy extends to jewelry, which makes it tricky to decide what pieces to bring on vacation. I always end up with way too much in my suitcase. Packing jewelry on vacation is frankly a pretty risky endeavor to begin with. If you don’t have an excellent travel jewelry case or otherwise fool-proof storage solution, you risk opening your luggage on a massacre of knotted chains and jumbled rings. I’ve permanently tangled some of my favorite necklaces by packing them improperly. The good news is that there are plenty of well-made travel cases specifically designed to keep your favorite jewelry pieces safe while in transit. From small leather boxes with secure straps for rings and earrings to huge portfolios that can hold your entire collection, there’s an option for everyone. Why you’ll love it: The Leatherology Large Jewelry Case is big enough to hold as many pieces as you’d possibly want to bring on vacation, without taking up too much room in your luggage. Our obsession with affordable leather goods brand Leatherology is well-documented, so it’s no surprise they make a great travel option for jewelry. The Large Jewelry Case is one of the best on the market. The design reminds me of those zippered school supply cases we had growing up in the ’90s, only chic, minimalist, and meant to hold jewelry instead of Milky Pens. The case is made of full-grain leather with a gentle suede interior to protect your valuables. Details include six leather tabs for securing up to three necklaces, a panel with 14 holes for earrings, a removable ring bar, and two zippered pockets. Despite the ample storage possibilities, the case has a slim silhouette and won’t add a ton of bulk to your suitcase. Available in 10 gorgeous colors, it’s easy to find one that matches your aesthetic. And if that’s not enough customization for you, the case can be personalized with a monogram. All that makes the $85 price tag a total steal, especially considering the quality of the leather. Why you’ll love it: The Lily & Drew Travel Jewelry Storage Case is perfect for overpackers, plus it boasts a removable pouch for additional storage. „The size is just right for travel. It will hold plenty of jewelry for a trip — no more trying to pick and choose what I want to bring! I especially love that the ring organizer goes across instead of up and down, so all the rings don’t slide down on top of one another,“ writes one shopper. Why you’ll love it: The Cuyana Mini Jewelry Case stylishly holds a pared-down selection for a weekend away. 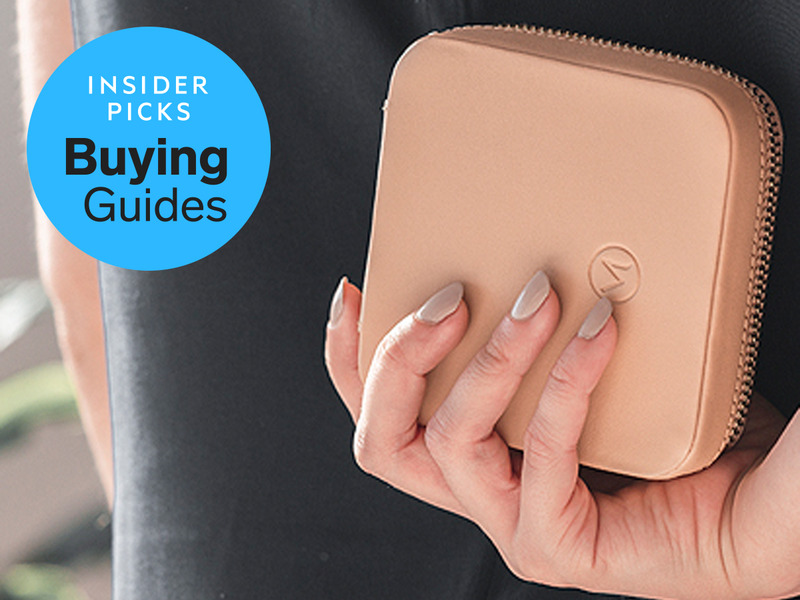 Cuyana makes pitch-perfect leather goods to suit every occasion. The brand’s Mini Jewelry Case is a fantastic option for storing a select few pieces in style. It’s ideal for short weekend trips, and if you’re the type who travels often you may even find yourself leaving it packed and ready-to-go at all times. This paired-down version of the brand’s full-size Jewelry Case features a leather strip for storing rings and/or earrings, plus a drawstring felt pouch in the bottom. The gorgeous Italian leather can be personalized with Cuyana’s signature monogramming and comes in five rich colors. Gold hardware and a tassel zipper pull add luxurious finishing touches. A major downside of this design is the lack of an individual necklace holder — you could store one in the drawstring pouch, but there’s no guarantee a delicate chain won’t get tangled. But if you gravitate more toward rings, earrings, and bracelets, this is a great option.